India’s NBFC’s Mr. V P Nandakumar MD & CEO, Manappuram Finance Ltd.
o help those who are watching their weight to keep of unwanted health problems, Coca-Cola is planning to sell a mid-calorie cola which is sweetened with sugar and the naturally occurring no-calorie sweetener stevia in Argentina, thus becoming the first to market with a product long seen as being critical to the soda industry’s growth. The new product, CocaCola Life, will have half the calories of regular Coca-Cola. The world’s largest soda company has used stevia in 45 products, such as Vitaminwater Zero and Fanta Select, but nevein its flagship cola. Coca- Cola Life has already gone on sale in Argentina, however there is no date for introducing the product elsewhere. he Ford EcoSport has been launched at a starting price of 5.59 lakh rupees in New Delhi. So what’s the benefit? You can trade your old car in for the brand new EcoSport, though it comes with a disclaimer- Ford is not offering any exchange benefits even for existing Ford customers who may own the Figo, Fiesta, Classic or the Endeavour. Although exchange is available, it will only be based on the value of your existing car. Currently, Ford offers exchange bonuses up o 25,000 rupees for the Classic and up to 15,000 for the Figo and the Fiesta. “Although there are no exchange benefits as such but there is exchange facility for the Ford EcoSport and we will offer attractive prices for existing Ford customers,” said AK Sing, executive director, Saachdev group that owns Harpreet Ford in the National Captial Region (NCR). ccording to the financial service provider Religare Enterprises Ltd U.S. based Customers Bancorp Inc has agreed to pick up a 6 percent stake in the Delhi based banking aspirant for $51 million (about 300 crore rupees). The multi-structured deal is part of Religare’s attempt to enter the banking fray, under which the promoters have to bring down their stake to 49 percent. The U.S. lender will be picking up the stake in Religare through a combination of primary and secondary market investment, financial services firm said in a statement. These teams will also enter into a business alliance agreement to find opportunities to service Religare’s customers across businesses, as well as potential customers for Customers Bancorp of Indian origin in the U.S. for their Indian investment needs. he Reserve Bank of India (RBI) on Wednesday has relaxed external commercial borrowing (ECB) norms and allowed companies to use the overseas debt in order to pay for the import of services, technical know-how and license fee as part of capital goods imports. Currently, eligible entities can raise ECB for investment such as import of capital goods, new projects, modernization/expansion of existing production units in industrial sector, infrastructure sector and entities in the service sector. “on review, it has been decided to include import of services, technical know-how and payment of license fees as part of import of capital goods by the companies for the use in the manufacturing and infrastructure sectors as permissible end uses of ECB,” the apex bank said. itan industries is expecting a higher interest cost from government curbs on gold financing to hurt earnings for the fiscal year ending on March 2014, despite falling gold prices driving up sales, a top company executive said. Indian jewellery makers have been hit by a series of government restrictions as the country scrambles to stem a swelling current account deficit. The Reserve Bank of India (RBI) has imposed measures forcing customers to pay upfront for gold and has prohibited credit from suppliers or bullion banks for import of gold for domestic use. India, the world’s biggest gold buyer, has also raised the import duty on gold twice since January 1, doubling it to 8 percent. n the wake of the 1200 crore rupees Saradha scam, where lakhs of investors were duped by the chit-fund company a move to boost investor confidence, the Finance Ministry has moved a note for an ordanance to promulgate a Securities Law Ordinance, which will give the market regulator Securities and Exchange Board of India (Sebi) more teeth to protect investors. The move will bring about amendments in the Securities Contract Act and the Sebi Act. The Sebi chief UK Sinha had on May 20th told NDTV that certain strengthening of the Sebi Act was required, adding that the government was seriously considering the same. ince the President of Walmart India Raj Jain has quit after having spent six years with the company, a shake up has begun in the sector. Raj Jain has been replaced by Senior Vice-President for Walmart International Ramnik Narsey. According to Walk Asia President and CEO Scott Price, “Ramnik brings significant management and leadership experience to the role,” adding that Walmart remains optimistic about their business in India and look forward to their future in India under Ramnik’s leadership. Jain’s exit out of the company comes in the backdrop of investigations by Walmart over allegations of corruption against it in foreign markets, including India. Jain’s exit does not seem to be a good sign for Walmart India which has been trying hard to enter the multi-brand retail segment for years now. he New Delhi Municipal Council (NDMC) has decided to seek the legal opinion from the solicitor general on the auction process of the five-star hotel Taj Mansingh, currently run by the Tatas, in New Delhi. The matter is subjudice as the Tataowned Indian Hotels Company (IHCL) had filed a special leave petition in the Supreme Court regarding the auction. The urban development ministry had earlier suggested that NDMC should go for open bids for the property in which the Taj Hotel is situated. IHCL had entered into a 33 year lease for using the property in 1978, which ended on October 2011 and was extended by another year till October 10, 2012. Last September, the NDMC gave another one year extension to the Tatas for operating Taj Mansingh besides giving the first right of refusal in an auction to be conducted within one year. he production at Bajaj Auto’s Chakan plant near Pune is crippled as the company’s nearly 2,000 employees continue their strike. The company has 925 permanent workers, besides 1,000 temporary and contractual employees and trainees. These 1,000 workers are also demanding permanent employment. “Our agitation continues and production remains crippled even today as the employees have not gone for work demanding wage revision,” Bajaj Auto Union sources said. The Union’s demands include 25 percent wage hike, permanent employment for contractual workers, reinstatement of some suspended employees and bringing back to Chakan plant those transferred outside. It is also demanding that workmen be given an option to subscribe to 500 equity shares of the company at a discounted price of Rs. 1 per share. McDonald’s and Politics M cDonald’s is finding itself on the front lines of a heated dispute over investment in Israeli occupied territories, after its license in Israel refused to open a restaurant in a West Bank settlement. “Our partner in Israel has determined that this particular location is not part of the growth plan,” a spokeswoman at McDonald’s U.S. headquarters tells Bloomberg Businessweek. The decision sparked anger in Israel, with the mayor of Ariel calling it “The Big McInsult.” Some called for a boycott of the fast food giant’s other Israeli outlets. McDonald’s isn’t the only multinational caught up in the controversy. Activist groups have called on corporations to close their operations in the occupied territories asking consumers to boycott products made by companies that remain. he CEO’s of top American technology companies, including Google, Yahoo and Microsoft, have hailed the passage of the comprehensive immigration reform bill by U.S. Senate. The executives are arguing that this would give a big boost to the economic growth and attract high skilled workers. Microsoft CEO Steve Ballmer said by passing the comprehensive immigration reform, the U.S. Senate took a significant step toward reforming the nation’s outdated immigration policies. “If enacted, these changes will strengthen our economic security, foster innovation and enable continued job growth in the U.S. Equally important, the legislation makes critical investments in our workforce by strengthening STEM education in the United States, including instruction focused on computer science,” said Ballmer. avid Neeleman, the serial airline entrepreneur who founded JetBlue Airways, says that he is not plotting to acquire his former company as part of a larger scheme in order to build a new international carrier for Brazil. Not that he does not think his own Brazilian upstart, Azul, could one day become a major international player as they have not ruled out Azul expanding internationally at some point time, however that does not mean that they have to buy JetBlue. Neeleman is the head of low-cost Brazilian carrier Azul Linhas Aereas Brasileiras is assembling an investment fund to acquire both TAP, the financially ailing Portuguese airline, and JetBlue. nion Minister of State, Prof. K.V. Thomas said that Mr. Vinod Rai was the person , who had redefined the role of the Controller and Auditor General in the country by emphasizing the importance of transparency in democracy. Prof K.V.Thomas observed that while there was a difference of opinion about some of the specific conclusions made by Mr.Vinod Rai, there could be no denying his wider contributions. Prof K.V.Thomas was presenting V.C.Padmanabhan Memmorial Awards instituted by Manappuram Finance Ltd to four persons including Mr.Vinod Rai. Accepting the award, Mr. Vinod Rai said that auditors generally do not get any awards and recognitions but this was an exception. He lauded Manappuramâ&#x20AC;&#x2122;s contribution towards popularizing gold loans which converts an unproductive household asset into a productive asset. He also recalled his long association with Thrissur as the District Collector going back over 40 years from his earliest days in the Kerala cadre of the IAS. Along with Vinod Rai, Veteran actor Mr.Madhu, Mr.Jose Dominic (Casino Hotels, Kochi) and Mr.V.D.Satheesan MLA were also received V.C.Padmanabhan award for their outstanding contribution in their respective fields. Therambil Ramakrishnan MLA presided over the function. Manappuram Group Chair Mr.V.P.Nandakumar, Thrissur Muncipal Corporation Mayor Mr.I.P.Paul, Dr.V.M.Manoharan were among the speakers on the award distribution function. Later, Former UGC Chairman Dr.V.N.Rajasekharan Pillai delivered the V.C.Padmanabhan Memmorial Lecture on the topic- Corporate Social Responsibility and Development- Indian Perscpective. ou should Bring the bad news early to win the faith of investors - this was the of advice Infosys chairman Narayana Murthy offered small business entrepreneurs. "Bring the bad news early and pro-actively to your investors. I always say, let the bad news take the elevator, good news can take the steps," he told an SME (small and medium enterprises) event organised by ICICI Bank in Mumbai Monday evening. "So as long as you are willing to be open to bring the bad news to the investors, then they will trust you," the Infosys chief said. "If they trust you, then you can take bold and tough decisions," he said and advised small business owners not to be "hesitant" in updating investors. Murthy was called back to the helm of affairs at Infosys after the IT giant was battered with serious loses last financial year. KEY CONCERNS FOR INDIA’S NBFCs Shri V.P. Nandakumar is the MD & CEO of Manappuram Finance Ltd.
n this article, I’ll take a look at some of the important issues confronting India’s NBFCs today. With financial inclusion a national focus, it is appropriate that I begin with a reference to how NBFCs promote financial inclusion. It is now official that India’s quest for achieving financial inclusion through the banking sector is not making much headway. Recently, the RBI Dy. Governor Dr. K.C. Chakroborty noted that under the financial inclusion initiative 150 million accounts were opened, but only 30 million transactions have taken place. The Commercial Paper market is going through a bearish phase in line with the current downturn in the economy. This has increased the funding challenges for NBFCs. loan NBFCs are much better than the banks. The percentage of customers with a grievance is actually far lower for gold loan NBFCs than for banks. Therefore, itâ&#x20AC;&#x2122;s time the RBI took an overall view of the matter. Knee-jerk responses: Official policies relating to NBFCs in general, and gold loan NBFCs in particular, have been prone to knee-jerk reactions. Extreme reactions have affected the stability of the sector and eroded investor confidence. It has affected prospects for future growth. dues to the public. In a competitive, free market setting, random instances of bankruptcies and defaults cannot be wished away entirely. In fact, it may even be a necessary evil, being the cost we bear in order to derive the full benefits of a flourishing free market economy. And so, when regulations are tightened too far with the objective of preventing defaults, there is the risk of stifling growth. Striking the right balance, therefore, is of the essence. of currency buys fewer goods and services. Thus, inflation results in loss of value of money or reduction in its purchasing power and thus will over a period of time convert your pocket into your shopping bag. For an “Aam Aadmi” inflation definitely has been a cause of worry. People have been looking at safe financial investment products that can provide return above the inflation rate. The absence of such products have seen savings flowing to investment in gold , thereby increasing its import and adversely affecting our current account deficit. It was keeping these in mind the Union Finance Minister in his Budget Speech 2013 proposed for the introduction of Inflation Indexed Bonds ( IIB) . Accordingly the first tranche of IIB were issued in the month of June 2013 for Rs. 1000 crores . The issue was however largely subscribed by large institutional investors such as pension funds, insurance and mutual funds. However, for the retail investor, new series of bonds are expected only by next quarter. whichever is higher, will be paid. The interest, however, would be paid to the investor from time to time depending on the terms. Final Wholesale Price Inflation (WPI) with four months lag will be used for providing inflation protection. i.e. Sept 2012 and Oct 2012 final WPI will be used as reference WPI for 1st Feb 2013 and 1st March 2013, respectively. These bonds will be issued by auction method. To begin with, these bonds will be issued for tenor of 10 years, though bonds with other maturities are also planned. bonds will have a better advantage over WPI linked bonds. During periods of deflation, adjusted principal can be less than the original principal. This could affect the periodic interest payments. But as the amount payable on maturity is the adjusted principal or initial amount paid, whichever is higher capital protection is guaranteed. A secondary market has to be developed so that individuals liquidity is not affected. The interest will be subjected to income-tax. As of now purchasing IIBs is not easy. It should be linked to CPI and made available to the retail investors through post offices or banks etc. Active secondary market has to be developed for these bonds so that adequate liquidity is provided to the retail investors. In such a scenario the amount received by sale in the secondary market could enjoy the benefit of cost inflation index especially if they are sold after three years. The product features and market is just emerging for the IIBs. But I feel it would be an interesting space to keep an eye on so as to protect your hard earned savings from inflation. rom a small showroom dealing with household equipments in Kurupam Road Thrissur, to 18 new generation retail showrooms spread all across Kerala, the journey that Gopu Nandilath undertook is quite scintillating. 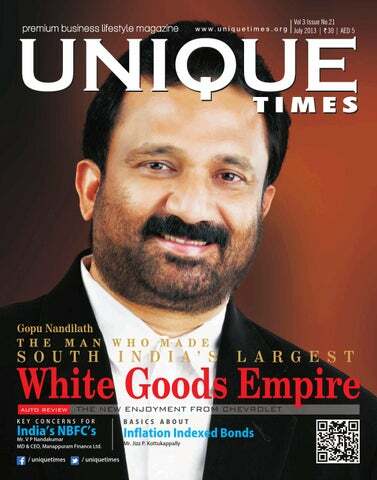 The tale of Gopu Nandilath Group which was founded 29 years back in the cultural capital of Kerala, Thrissur is a success story of finding place in consumerâ&#x20AC;&#x2122;s heart through their trusted service. The launch new age Nandilath G- Mart in Thrissur was a major turning point for him. He heralded the digital wave in the Kerala. With more than 200 international and national brands retailing in G-Mart catapulted itself to the top selling retail chains in India. Nandilath G -Mart has now showrooms spread all over Kerala give the consumers an amazing world of rare and most modern home appliances of the internationally popular brands. Gopu Nandilath Group sustains the No 1 dealer position of almost all the leading brands through our truthful service and the immense experience in sales and after sales service which no one else can claim. Our Associate Editor Bejoy George talks with Gopu Nandilath the man who runs the entire show about his life and business. We always believe that great support brings back more customers. We also try to provide authorized service where it is possible. Chovva in Kannoor, Karamana in Trivandrum, Edappally in Kochi, Calicut Road-Perinthalmanna, TanaIringalakkuda, Kadappakkada-Kollam Main Road-Koilandy , Bypass RoadVadakara, Vadanappally, Mele Pattamby, and Mannarkkad. We are planning to increase our presence to more towns and make our showroom count to 50.
refrigerators, like double door refrigerators. Same is in the case with Televisions, earlier we had 20 inch and 21 inch CRT televisions, now we have big size 3D LED televisions. What I am trying to say is the scope of this business. There is always a latent need to up the comfort. Looking from another angle we are helping people to be more comfortable and happy. Why did you choose white goods business. What are the values you keep in your business? One of the major advantages that our consumers see in us our strong support system. We always believe that great support brings back more customers. We also try to provide authorized service where it is possible. We always treat customers like kings, we try to understand their needs and provide all support to make a choice. We have 18 outlets across all major cities and towns in Kerala. We have a customer base of more than 2 Crores. We deal with more than 200 national and international brands and over 5000 types of products. We make sure that once a person becomes a Nandilath G-Mart customer he will come back to us for his future purchases. I also believe that there is no substitute for hard work. It is just hard work that made our business, what it is today. one Umbrella'. We wish to make it happen with the support and blessings from all the good customers and well wishers. In line with our vision we are planning to increase showroom count to 50 in near future. What is your current business Size? of sports, and cricket in particular. I have travelled to watch the finals of several football world cup editions. I have travelled to Pakistan with a special visa to see cricket matches. I also went to the Olympics and other major sporting events. I also had the honour to give the man of the match award to the great Sachin Tendulkar in post match ceremony in Sri-Lanka What is your favourite destination? All places have some unique charm, and as a traveller I enjoyed visiting this entire place. If you ask me for a particular destination, I would say New Zealand, those islands are really beautiful and the people are very friendly. Australia is also as a charming as New Zealand. About your family? We are settled in Thrissur. My wife Shiny, has been a strong support for me and my business. My daughter Aiswarya Sujith Nandilath and Arjun Nandilath help me understand new trends that appeal to youth. the cities and surprisingly handled really in the hill roads also. The steering is really nice and light, but it does inspire confidence at high speeds. The gearshift is pretty smooth and gears falls into the slot correctly. There is a little bit of noise coming into the cabin once you cross the 1200 rpm mark. Slipping into the seats after opening the big doors is dead easy, they are almost at the perfect height, and once inside, legroom and headroom on both rows is plentiful. Chevrolet has done a good job with Enjoy. The diesel version is supposed to well in Indian market, which is diesel incline. The new diesel engine has a lesser lag that Chevyâ&#x20AC;&#x2122;s earlier engines. The acceleration till 4000 rpm is quite good, but after that it loses steam, but donâ&#x20AC;&#x2122;t mind by that you will be far ahead in the road. Indian families those who love to travel together, has a reason to enjoy now, they have a good option to be the family rider. Overall the new car delivers well for the customer. There are some concerns including the plastic quality and equipments list. Chevrolet Enjoy has all the reasons in it for you to own. Enjoy your driving. Dr. Thomas Nechupadom heads Metanoeo, a total transformation/ grooming company that has been the by word for grooming and dressing, personality enhancement and Social/Corporate Etiquette for many pageants including Ms.South India and Mannapuram Ms. Queen of India contest 2012. There is lot of sacrifice to be done if you want to be a successful entrepreneur. You also have to dream big and have a clear vision. There is lot of sacrifice to be done if you want to be a successful entrepreneur. You also have to dream big and have a clear vision. An entrepreneur will have to visualize success and feel it. . You should actively visualize success in your mind that you can almost feel it, touch it or it is within your reach. Play this image back at every opportunity. How will your life change? What will your business look like if you achieved the big milestone? Probably all these you know. Here come the flip side, you will also have to maintain some rules to become success. May be it sounds a little difficult, it may not that difficult if you practice it earnestly. First of all it your attitude; successful entrepreneurs possess an attitude of openness and faith that you can have what you want if you can simply envision it as the first step on the path of action to acquiring it. Self-help gurus have taught us the power of visualization. If you want to be a successful writer, envision yourself signing books for a throng of people who have lined up to have your autograph. A personal development coach shared me her secret to help her continuously visualize her goals for the moment: when climbing stairs, recite your goal with every step you take. 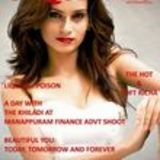 So if you want more money, say â&#x20AC;&#x153;I will have moneyâ&#x20AC;? in every step of the stairs. This technique will reinforce your goal and keep it fresh in your consciousness. You have inherent strengths; you will have to focus on it. Everything cannot be done by everybody that is what makes us all unique. To be successful, you need to identify your strengths and concentrate on it. You will become more successful if you are able to lead your efforts to areas that you do best. In business you know you have good marketing instincts, then exploit this strength and make full use of it. Seek help or support in areas that you may be poor at, such as accounting or bookkeeping. To transform your weakness to strength, consider taking hands-on learning or formal training. An entrepreneur is always open for new learning. You need not be highly educated to be an entrepreneur. In fact, there are a lot of entrepreneurs who did not even finish secondary education. Studies show that most selfmade millionaires have average intelligence. Nonetheless, these people reached their full potentials achieved their financial and personal goals in business because they are willing to learn. To succeed, you must be willing to ask questions, remain curious, interested and open to new knowledge. This willingness to learn becomes more crucial given the rapid changes in technologies and ways of doing business. businesses. Maybe the lady you met in a trade association meeting can help you secure funding, or the gentleman at a conference can provide you with management advice. It is important to form alliances with people who can help you, and whom you can help in return. To succeed in business, you need to possess good networking skills and always be alert to opportunities to expand your contacts. Successful entrepreneur’s works very hard. Brian Tracy puts it out this way, “You work eight hours per day for survival; everything over eight hours per day is for success.” Ask any successful businessperson and they will tell you immediately that they had to work more than 60 hours per week at the start of their businesses. You should be prepared to bid good bye to your little pleasures to concentrate more on your work. You will have to live your business. Self discipline is ultimate key to success. Thomas Huxley once said, “Do what you should do, when you should do it, whether you like it or not.” Self-discipline is the key to success. The strength of will to force yourself to pay the price of success – doing what others don’t like to do, going the extra mile, fighting and winning the lonely battle with yourself. Beauty Tips to Keeps You Fresh while Traveling Exercise when you have the opportunity, this will keep the skin nourished with increased blood circulation. A glowing skin will keep your confidence level up. Keep your skin moisturized with hydrating lotion, especially if you have airconditioning. Use a good quality sunscreen especially while travelling by road. Apply sunscreen generously not only to your face but your neck, chest and hands. When you are travelling stick to a basic skin care routine; do not overdo any kind of skincare application. Stick to a fruit based diet and eat plenty of fresh fruits instead of junk food. Drink a lot of water that will detox your skin and flush out the toxins Fight the urge to pick or squeeze! Your skinâ&#x20AC;&#x2122;s ability to heal slows down when travelling, as your skin is focused on adjusting to a new environment. Because water retention tends to occur during travelling, your eyes may become puffy. Use an eye gel instead of a cream along with some eye drops to keep your eyes moisturized. Soak in a hot bath during the evening time if possible. Not only will the heat relax your tired muscles, the steam will open the pores to allow better penetration of your night cream. Donâ&#x20AC;&#x2122;t forget your beauty sleep! Sufficient sleep is essential to healing your skin. New Zealand is marketed abroad as a "clean, green" adventure playground, with typical destinations being nature areas such as Milford Sound, Abel Tasman National Park or the Tongariro Alpine Crossing, while activities such as bungee jumping or whale watching exemplify typical tourist attractions, often marketed primarily to individual- and small-group travellers. The Waikato River, New Zealand's longest river, flows through the middle of the city. The city is famed for its Art Deco architecture. The 1931 Napier earthquake and a subsequent fire destroyed much of the downtown business area. scenery. The city is the economic and cultural centre for the Nelson-Tasman region and offers an excellent range of shopping, eating and cultural experiences with an abundance of parks, rivers, beaches and nature trails to explore. It is the place that most kiwis would like to retire to - if they could afford to, since Nelson has some of the most unaffordable housing and lowest "sunshine" wages in New Zealand. Queenstown is a scenic town in the South Island of New Zealand. It is one of the most beautiful regions and offers year round attractions. The town sits on the edge of Lake Wakatipu and is surrounded by the Southern Alps. The most remarkable sight is the Remarkables, which is a saw-toothed range of mountains on the opposite side of the lake from the town. have people returning to The Coromandel time after time. Abel Tasman National Park is in the Nelson Tasman region of the South Island of New Zealand, between Golden Bay and Tasman Bay. Located in the Nelson and Marlborough Regions on the northern tip of New Zealand's South Island; The park is closed to vehicles, and access is either on foot (from one of the various car parks mentioned below) or by boat, or if you've got money to spend it is possible to charter a helicopter or small plane. Some of the land in the park is privately owned - mainly in Awaroa Bay and Torrent Bay. It is important to remember this when visiting the park - the locals are friendly but they don't want loads of travellers walking through their backyards all the time! However these areas are clearly marked so you shouldn't have any problems. International tourism, especially foreign-student education for the Asian market, was a growing sector of the Christchurch economy, as is electronics and software development. Because of this there is a high concentration of cyber-cafes here. Christchurch is the largest city in the South Island of New Zealand with a 2006 population of over 350,000, making it the second largest city in the country after Auckland. It is on the edge of the Canterbury plains and is a major stepping off point for touring the South Island. Christchurch was established in 1850 by English settlers. Its English heritage shows in the older buildings, especially in the cultural precinct along Worcester Boulevard. The River Avon flows through the central city and disrupts the regular rectangular layout of the city streets. The Peninsula separates the Hauraki Gulf and coasts around Auckland from the Bay of Plenty. The Peninsula is a popular holiday destination and can get very busy during the summer months. Local towns include Thames, Coromandel and Whitianga and Whangamata. Smaller settlements include Te Puru, Waiomu, Tapu, Colville, Whangapoua, Matarangi, Kuaotunu, Coroglen, Cooks Beach, Hahei, Hot Water Beach, Tairua and Pauanui. Tongariro National Park is New Zealand's first national park and a World Heritage site. The park contains 3 active volcanoes as well as 2 major ski fields. In 1993 Tongariro National Park became the first property to be inscribed on the World Heritage List under the revised criteria describing cultural landscapes. The mountains at the heart of the park have cultural and religious significance for the Maori people and symbolize the spiritual links between this community and its environment. The park has active and extinct volcanoes, a diverse range of ecosystems and some spectacular landscapes. Today’s lifestyle requires you to be busy. Most of the people find it difficult to squeeze time in between their busy schedules to find time to work out. oday’s lifestyle requires you to be busy. Most of the people find it difficult to squeeze time in between their busy schedules to find time to work out. The problem becomes worse when you go out of town for a business or pleasure trip. Your tight schedules and in a rather unknown place can easily derail your fitness routine. With a little amount of management and some tips you can take control of your fitness regime. Consider a pair of tennis shoes specifically for travel that will smash or bend for easy packing. Fill a baggie with mixed nuts and dried fruit, energy bars, and fresh fruit for emergency snacks to make unhealthy options less tempting. During travel, you may need to spend a lot of time waiting you can take advantage of this time. Major airports in world have places for yoga and walking tracks. Most of the hotels have fitness centres. You need to dress suitably to take advantage of any opportunity arising to do a workout. Exercise opportunities on the road won’t do you much good if you are not prepared. If your business attire doesn’t allow for athletic footwear, invest in a comfortable pair of dressy shoes. Rubber-soled dress shoes or a stylish pair of flats can make all of the difference. At the very least, carry your athletic shoes in your carryon. Stick with a comfortable, yet presentable, outfit so you can walk the terminals during a layover. The same preparation tips stand for road trips. A quick walk around the parking lot at the rest stop will stretch the legs and burn a few calories. Be very careful with what you eat. Convenience stores and gas stations may be the easiest place to stop while on the road, but they can be a nightmare for a healthy eating plan. Instead, visit the nearest roadside farm stand, or follow the signs to the Farmer’s Market where you can find fresh produce to provide healthy fuel. For meals, skip the fast food and stop by a supermarket for a prepared salad or healthy sandwich. Make some extra space in your baggage for your fitness essentials like the band and apparel. Be sure you leave space to squeeze in fitness essentials. An exercise band or tube will fit in the outside pocket of your bag for hotel-room strength training. Try to walk more during free time. Visiting a market during your travels combines a learning opportunity, exercise, and healthy food into one adventure. Set out on foot if the market is nearby – every extra step counts. Take advantage of the fresh produce, and meals for a healthy breakfast, lunch, or snack. project in the city you Book an active excursion. Make visit. This will allow you to borrow a bike to see the sights while burning calories. If you enjoy road races, look for upcoming events at your destination. Local fitness studios may have active weekend retreats, or a boot camp class that you can join during your trip. The most important thing is get enough rest. Travel can leave you sleep-deprived and unable to get the recommended seven to nine hours of sleep for adults. Lack of sleep can result in weight gain. When you are exhausted from being on the road, make sleep a priority. Continue to choose healthy foods, but it may be wise to skip a workout when your schedule causes exercise to compete with sleep. Plan to get back to your exercise routine once you return home. But remember, exercise can improve sleep patterns if done at least three hours before bedtime. If you are having trouble sleeping on the road, a workout may help. player's bag at one time during a stipulated round. The choice of clubs is at the golfer's discretion, although every club must be constructed in accordance with parameters outlined in the rules. Clubs which meet these parameters are usually called "conforming". Violation of these rules can result in disqualification. The exact shot hit at any given time on a golf course, and which club is used to accomplish the shot, are always completely at the discretion of the golfer; in other words, there is no restriction whatsoever on which club a golfer may or may not use at any time for any shot. Golf balls are spherical, usually white (although other colours are allowed), and minutely pockmarked by dimples that decrease aerodynamic drag by increasing air turbulence around the ball in motion, which delays "boundary layer" separation and reduces the draginducing "wake" behind the ball, thereby allowing the ball to fly farther. There is a lot. There is a lot more learn about golf. Once you start learning, you will â&#x20AC;&#x2DC;?more be interested to learn more about this game. business book about more than business: the ultimate guide to improving your work/life balance. Whatever your job is, chances are you find it hard to switch off. Today, we work longer hours, at weekends, at home and on the move while the office is only ever a click away via smart phones and the Internet. But as much as we assume that this is the price of success it doesn't have to be this way. Martin Bjergegaard and Jordan Milne are here to show you how to build your business into something big, sustainable and widely recognized and still lead a happy, whole and balanced life. In sixty-five short insights, they reveal strategies and methods which will allow you to combine professional success with putting friends, family and happiness first. Their Efficiency Boosters will increase your effectiveness, while you'll learn all about how to avoid Time and Energy Wasters and build aNew Mindset that gives you to optimism and enthusiasm needed to succeed. ou have a job. And an idea for a business. What do you do then? Crisp, reader-friendly and practical, Entrepreneur 5 p.m. to 9 a.m. tells you how you can become an entrepreneur even if you have a full-time job and are risk-averse. With facts, flowcharts and illustrations, this is a fast and super-useful read from which you will come away with a clear and solid roadmap for converting your idea into a viable enterprise and taking your venture from zero to launch. n The Professional, one of the biggest-selling business books ever to come out of India, Subroto Bagchi asked the key question: What does it mean to be a professional? He outlined a few characteristics that mark a thorough professional, and showed how one can behave professionally or otherwise in diverse situations, in and out of the workplace. Inspired by the lessons learnt from that game-changing book, many an aspiring professional has been wanting to test his/her mettle using Bagchis tools. The Professional Companion fulfills exactly that need. In this do-it-yourself workbook that is meant as a companion volume to The Professional, Bagchi takes you through simple exercises that allow you to understand how professional your approach is in a given context, and helps you develop a wider skill set and a more committed outlook. eaders insist on sticking to the time-tested formulae of either functional leadership that focusses on operational excellence or smart leadership that focusses on growth. When a leader's focus is too functional, the organization becomes introverted and can focus too much on bottom line profitability while missing out on topline growth opportunities. But when leaders focus too much on smart leadership, the organization may experience quick growth but lose its effectiveness quickly. To strike a fine balance between From Smart to Wise provides a fresh and timely approach to nurturing wise, resilient, and flexible leadership in a world of growing complexity. Drawing on inspiring real-life stories of historical and contemporary wise leaders such as Mahatma Gandhi, Bill Gates, and Warren Buffet the authors identify six characteristics of wise leaders and offer a practical framework to help readers develop their own style of wise leadership that is both functional and smart. n February 2011, Anna Hazare suddenly shot to the nation s attention when he conveyed to the prime minister his intention to fast on matters relating to corruption. Since then, he has galvanized a massive, national movement to combat corruption in the country. So, how did Mr Hazare, at the age of 74 and relatively unknown to the masses, manage to spearhead this movement against corruption? Simply put, how did he become a leader? It is this question that Leading without Licence: Leadership the Anna Hazare Way answers. In this book, Satheesh Namasivayam and Sivaram Bandhakavi illustrate how Mr Hazare is masterfully practising a set of principles, proven to be effective over the ages, in exercising leadership. As they explain, leading is an act that comprises the performance of smaller sub-acts, in expanding circles of influence. If you understand these sub-acts and know how to combine them, you too can become a leader. ITians in India are a privileged lot. They toil to enter the portals of India's most prestigious engineering college, but once their education is complete, seven figure salaries and blazing career paths await them. However, there are people who break the mould â&#x20AC;&#x201C; IITians who have rejected cushy jobs because their inner instinct told them that bigger and better things awaited them if they took a different path. This book traces the story of 20 such individuals from IIT Kharagpur. The book covers the stories of some quite well-known figures. They include Krishna Mehta, Ventakata Subramaniam, Sunil Gaitonde, Arvind Kejriwal, Anuradha Acharya, Vikram Kumar, Bikash Barai, Praful Kulkarni, Anand Deshpande, Vijay Kumar, Arjun Malhotra, Sam Dalal, Suhas Patil, Kiran Seth, Bikram Dasgupta, Prabhakant Sinha, Ranbir Singh Gupta, Vinod Gupta, Sridhar Mittal and Harish Hande. Communication may be intentional or unintentional, may involve conventional or unconventional signals, may take linguistic or non linguistic forms, and may occur through spoken or other modes. process is complete once the receiver has understood the message of the sender. It might seem easy, but communicating effectively actually takes quite a bit of finesse. Choosing the right words, listening with our minds instead of just our ears, and getting our message across are skills that we all need to work on. Read on for some tips. No matter how well intentioned and intellectually compatible the group of people you've hired may be, inevitably you're going to have squabbles over who jammed up the copier or accidentally deleted a coworker's file. Most minor issues will blow over on their own, but a few can turn into major disputes. Some office arguments can be serious enough to prompt legal action. It doesn't matter whether you're producing movies or computer chips, the work day can be as fun and exciting as your company wants to make it. You don't have to come up with these kinds of creative ideas yourself. There are companies that specialize in coming up with and implementing employee perks that will do all the work for you Giving employees as little as 15 minutes a day to cut loose can make them much more appreciative and productive when they do need to put their noses to the grindstone. No employee wants to exist in a vacuum. Whether they're working tirelessly to get projects done or slacking off, your workers need to know that you recognize and appreciate their efforts or expect them to work harder. You don't have to hold regular meetings to share feedback, although that's one way to do it. There are many other ways to let your employees know what you're thinking through email, phone calls, or a brief status update a couple of mornings a week. When employees feel as though they have control over their job, they feel a sense of purpose and are more invested in the entire process. Autonomy breeds innovation and job satisfaction. Babysitting, on the other hand, makes employees feel as though the company doesn't consider them competent enough to do their job. They feel insecure and unmotivated. You have conversations with your employees all day, but are you really listening? If you're thinking ahead to the next meeting or planning tonight's dinner during the conversation, you're not paying attention. Being an effective communicator means listening as well as talking. Sounds easy, but listening actually takes some practice. The city is located in the province of North Holland in the west of the country. It comprises the northern part of the Randstad, one of the larger conurbations in Europe. Each Free Zone is designed around one or more business industry categories and only offers licenses to companies within those categories. Free Zone Authority offers business licenses to foreignowned businesses. Each Free Zone is designed around one or more business industry categories and only offers licenses to companies within those categories. Advantages of Free zone A company set up in a Free Zone offers owner 100 % import and export tax exemptions, 100 % repatriation of capital and profits, Corporate tax exemptions for up to 50 years, Purpose built office or warehouse facilities, No personal income taxes, Assistance with labour recruitment and additional support services, such as sponsorship and housing. Each Free Zone is designed around one or more business industry categories and only offers licenses to companies within those categories. An independent Free Zone Authority (FZA) governs each free zone, and is the agency responsible for issuing FTZ operating licenses and assisting companies with establishing their business in the FTZ. Ras Al Khaimah in the northernmost part of the U.A.E., 45 minutes by road from Dubai. It was established in May 2000 by an Emiri Decree from Ras Al Khaimah's ruler His Highness Sheikh Saqr bin Mohammad al-Qassimi, with His Highness Sheikh Faisal bin Saqr Al Qassimi as its Chairman. RAK FTZ has five parks in Ras Al Khaimah â&#x20AC;&#x201C; Business Park, Industrial Park, Technology Park, Aviation Park and Academy Zone. It also has representative offices in Turkey, India, Germany, and USA and is the first free zone to offer business centre as well as innovation and promotion centre facilities in four locations in the UAE. Jebel Ali Free Zone is a free economic zone located in the Jebel Ali area at the far western end of Dubai, United Arab Emirates, near Abu Dhabi. Created under an Emiri Decree, Jafza commenced operations in 1985 with standard size office units and warehouses to provide ready built facilities to customers. In 1990 Jafza expanded its facilities to include light industrial units. Ajman free zone was established in 1988 and was granted autonomous status under the Amiri decree no.3 of 1996 issued by H.H. Sheikh Humaid Bin Rashid Al Nuaimi, ruler of Ajman. infrastructure. The free zone also provides direct access to a number of government services, including Immigration, Customs and the Chamber of Commerce helping to streamline red-tape procedures and provide clear processes and guidelines. International investors will reap the benefits of dynamic growth for their companies, through the free trade zone's excellent tax and investment incentives, such as 100% tax exemption, 100% foreign ownership. Ajman Free Zone Ajman Free Zone is a free trade zone in Ajman, one of seven emirates in the United Arab Emirates located on the Arabian Peninsula and in the Persian Gulf. The zone was established in 1988 and was granted autonomous status under the Amiri decree no.3 of 1996 issued by H.H. Sheikh Humaid Bin Rashid Al Nuaimi, ruler of Ajman. Ajman Free Zone Authority has been named as the sole regulatory agency for Free Zone in the Ajman. The formation of the Free Zone Authority in 1996 has given impetus to industrial activity in the Free Zone which has resulted in quadruple growth in the number of companies during the last few years. A multi-million Dirhams development plan on over a mission square metre area is under progress at the Free Zone, which on completion will be able to accommodate 4000 companies. Situated at the entrance of the Persian Gulf, Ajman Free Zone is well placed to serve the eastern and western markets. For anybody who would like to explore the lucrative market of the Middle East and GCC, free-zone will be a good option to start with. The free-zone management is all willing to help you start your business. his is app from Infosys. Art & Science strives to share rare, human, interesting, and highly practical insights into the world of business. The goal-as the name implies-is to approach these insights from both a right- and left-brain perspective; this app is for people who take business seriously, but not so seriously that imagination, creativity, and freedom of exploration never see daylight. nsightly is designed as a simple to use yet powerful CRM system for small business. With integrations to Google Apps, MailChimp, LinkedIn and Twitter, and with great mobile apps for tablets and smart phones, Insightly is the leading customer management system for small business. Insighlty is the best choice for smaller businesses, because you donâ&#x20AC;&#x2122;t have to worry about anything technical like server upgrades or security fixes. Over 300,000 users in 100 countries rely on Insightly every single day. alesforce.com Inc. is a global enterprise software company headquartered in San Francisco, California. Though best known for its customer relationship management (CRM) product, Salesforce has also expanded into the "social enterprise arena" through acquisitions. It is currently ranked the most innovative company in America by Forbes magazine, as well as number 27 in Fortune's magazine's 100 Best Companies to Work For in 2012.
mniGraffle is a diagramming application made by The Omni Group. OmniGraffle is built only for Mac OS X and the iPad. It may be used to create diagrams, flow charts, org charts, and illustrations. It features a drag-anddrop WYSIWYG interface. "Stencils"â&#x20AC;&#x201D;groups of shapes to drag and dropâ&#x20AC;&#x201D;are available as extensions for OmniGraffle, and users can create their own stencils. ocial media marketing refers to the process of gaining website traffic or attention through social media sites. Social media marketing programs usually centre on efforts to create content that attracts attention and encourages readers to share it with their social networks. A corporate message spreads from user to user and presumably resonates because it appears to come from a trusted, third-party source, as opposed to the brand or company itself. Social Media marketing requires a lot of patient listening from your clients and that require very less amount of talking. Go through your client’s online content and join discussions to learn more about them. Once you know you customer you can create influencing content. Compounding Focus Be focused in your strategy, specialized content will always receive good support and shares. A highly-focused social media and content marketing strategy intended to build a strong brand has a better chance for success than a broad strategy that attempts to be all things to all people. Quality Quality is always better than quantity. It is better to have 1000 online connections who work, than 10000 online connections that don’t work and disappear after connecting with you the first time. Reciprocity You should also share good content from your connections, if you want them to share your content. Please be generous in promoting content. If your content is of amazing quality and work to build your online audience of quality followers, they’ll share it with their own audiences on Twitter, Facebook, LinkedIn, their own blogs and more. This sharing and discussing of your content opens new entry points for search engines like Google to find it in keyword searches. Those entry points could grow to hundreds or thousands of more potential ways for people to find you online. Acknowledgment You wouldn’t ignore someone who reaches out to you in person so don’t ignore them online. Building relationships is one of the most important parts of social media marketing success, so always acknowledge every person who reaches out to you. Influence Spend time finding the online influencers in your market who have quality audiences and are likely to be interested in your products, services and business. Connect with those people and work to build relationships with them. Accessibility Don’t publish your content and then disappear. Be available to your audience. That means you need to consistently publish content and participate in conversations. Followers online can be fickle and they won’t hesitate to replace you if you disappear for weeks or months.